Following Blue Ink’s success of Hein Gericke’s 4theride.co.uk campaign during 2009 they were looking for something similar to push their company. While they weren’t in a position to actually sell bikes online, they were keen to keep their exisiting navigation so it was up to me to re-work the interface in to a more presentable and definate fashion. I did this by colour coding each brand department and make it look more like an online catalogue instead of a website, which I feel I have achieved. 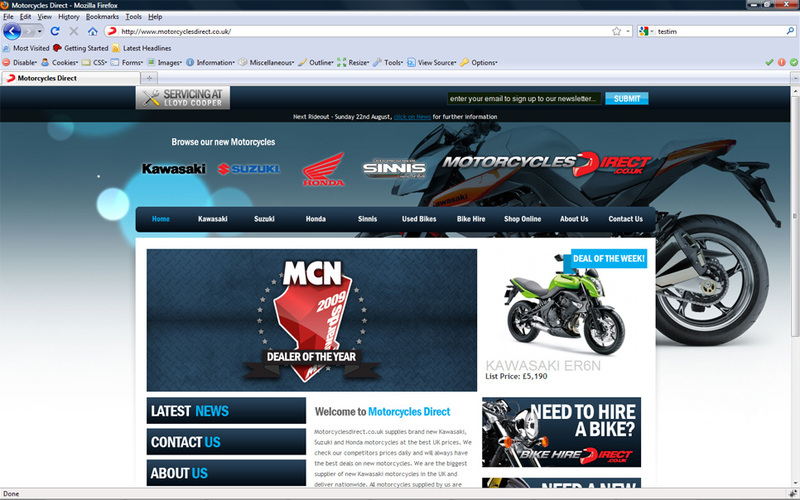 This entry was posted on Saturday, September 4th, 2010 at 8:14 pm	and is filed under MotorcyclesDirect.co.uk, kidd81.com general, webdesignermag.co.uk. You can follow any responses to this entry through the RSS 2.0 feed. You can leave a response, or trackback from your own site.